Postmarks is perhaps the second most researched area of philately, following that of postage stamps alone. 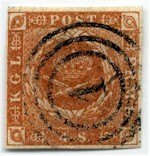 The importance of postmarks is unique and significant in tracing back the history of postal services of a village, town or city at a particular period. 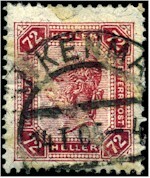 A postmark is a postal marking applied on a postal article (letter, postcard, telegram, package). When any such article is lodged with the postal authority, a postal rate would be identified for posting it to its expected destination. The rate is then paid in exchange of postage stamps, which are adhered on the article and later, postmarked. Early postmarks used (circular or diamond-shaped postmarks) incorporated a number in the middle, identifying a village, a town or a city. Each location (post office) had its unique number. In other cases, this was used inconjunction with a normal postmark prepared for that town, with changable date. 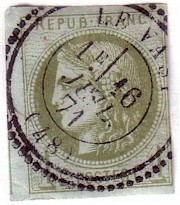 There are scarce postmarks depending on the remote location of a village or a town. Should such places have a small number of inhabitants, their postmarks could be scarce indeed. Therefore, it's essential that postmarks on stamps and / or covers are well-inked (but not heavy) and are applied in full for visual identification. 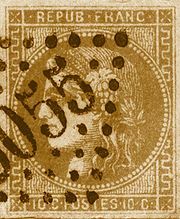 Postmarks applied at the centre of a postage stamp could be in greater demand, for the obvious reason of their visual identification. If part of the postmark is applied on the postage stamp, collectors may need to restore the cover (if intact), or as much area of the cover as possible for preserving the whole postmark (if the stamp is not soaked off the paper). Today, postmarks are mostly applied by machines and digital postmarks have been applied recently.